A bunion is a deformity of the metatarsophalangeal (MTP) joint of the big toe. The metatarsal of the big to begins to swing toward the inside of the foot. The proximal phalanx of the big toe deviates to the outside of the foot. As a result, the end of the metatarsal becomes prominent and can push against the shoes. This pressure is very often not tolerated if the shoe is tight. Typical bunion pain usually occurs with the use of poorly fitting shoes, but can be experienced in any shoe as the sensitivity worsens. The bunion often does not hurt when barefoot. While pains in areas other than along the bony prominence are frequent, these suggest other diagnoses that may need separate attention. 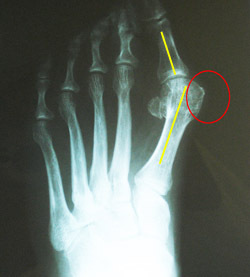 A bunion occurs when the metatarsal bone and phalanges of the big to drift out of alignment (yellow bars) and make the end of the proximal phalanx prominent (red circle). As the toe begins to tilt, the long tendons that cross the joint deviate from the midline of the joint, perpetuating the deformity. Some bunions develop in childhood. Most, however, become deformed in adulthood. Many times, tight shoes are implicated, but many other things influence the development of bunions. In fact, bunions are much more common in any shoe wearing society, not just in people who wear “bad” shoes. Bunions are much more common in women and family history is very common. This implies that hereditary/genetic factors are important. Inflammatory conditions, many of which may be not defined by medical science, may be responsible in some cases. 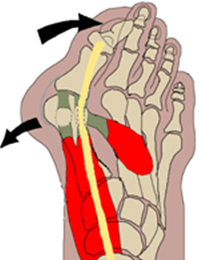 Overload of the forefoot may lengthen and loosen the ligaments of the joints in the midfoot. The loosening of these joints may allow the metatarsal to deviate to the inside of the foot. As the toe begins to deviate out of place, the tension of the tendons crossing the joint can cause the deformity to worsen. Bunions first and foremost must be put in perspective. The mere presence of a bunion does not obligate you to surgery. Bunion deformities are often tolerated with minor alterations in shoe wear. Many bunion deformities do not worsen with time and those that do usually worsen very slowly. Shoes should be selected that have adequate width and a compliant upper, the portion of the shoe that goes over the sole. Appropriate materials for a comfortable shoe upper include leather and foam (such as Spandex) material. Avoid seams that run over the bunion because the seams do not stretch well and can cause pressure over the prominence. Heels tend to jam the toes into a narrow wedge in the toe of the shoe and so lower heels or flats are recommended. 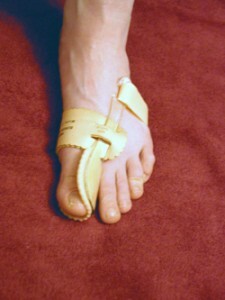 Shoe stretchers can be used to maintain the volume of the shoe. These shoe stretchers can be expanded to widen the toe box. In addition, small bumps can be placed on the stretcher to wear the shoe in. Some planning is necessary the night before so that the proper shoe is stretched for the next day. 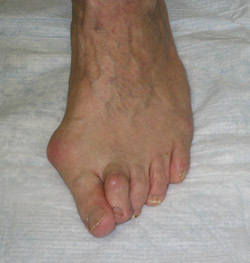 Fallen arches and painful arches are often associated with bunions. Arch supports may help this type of bunion. Inexpensive over-the-counter arch supports seem to be as effective as custom inserts. Arch supports are not otherwise necessary in the treatment of bunions. Surgery can be considered if the foot continues to be unacceptably painful despite adequate attempts at comfortable shoe wear. Surgery involves stabilizing the foot through fusion or osteotomy (cutting and resetting the bones) as well as tightening some ligaments and loosening others. Many factors go into the specific selection of the procedure include when in your life the bunion developed (childhood vs. adulthood), the alignment of the rest of the foot, the severity of the bunion, and your surgeons own experience and preference. Bunion surgery is a significant experience. Expect a period of time of several weeks in which you will not be able to walk on the foot (or only on the heel), the need for strong pain medication, and prolonged swelling that may interfer with shoe wear.